Susheela Kumari, an attendant at a cow shelter, collects urine to be processed in Bulandshahar, Uttar Pradesh, India. Boxes of soap from Cowpathy Care. Cow dung is dried and turned into a powder, then added to the bars. Cows are sacred in Hinduism. Ayurveda, the ancient Indian science of life, says that cow products like dung, milk and urine have healing properties. Many rural Indian homes use cow dung to pave floors. And many Hindus believe drinking cow urine is good for health. Soni, 35, started making cow dung soaps in 2008, but he's certainly not the first to use these items in beauty products. Initially, his customers were devotees at a Hindu temple in Mumbai. Today, the microbiologist and MBA graduate sells to customers from a dozen countries. In 2012, he launched his own cow-based beauty products line. Cowpathy Care, as it's called, offers 80 products, including cow dung soaps, cow milk creams and an under-eye gel made from cow urine. And the market is growing. In 2014, the Hindu nationalist Bharatiya Janata Party (BJP) came to power and made it a special mission to elevate the role of the cow. There have been calls to ban eating beef in many states. Cow protection squads have popped up. Angry mobs have lynched people suspected of smuggling cows. And bovine merchandise is on a roll. Stores in India are being flooded with cow-based products, from soaps to toothpaste. Soni's company is one of the many startups in this sector. He is reluctant to attribute his success to the political climate but admits that it has played "a wonderful role in giving business to people who are making cow products." Mumbai resident Chitralekha Rane, 32, says she regularly uses cow-based products. Cowpathy's cow dung soap with sandalwood and Fuller's earth, a type of clay, is her favorite. She buys Cowpathy products to gift to her friends and colleagues during the Indian festival Diwali. She also uses a cow milk soap for her baby. A bar of Cowpathy soap can cost from 20 cents to a little over a dollar depending on the type — about the cost of regular bars of soap. For his products, Soni uses dung, urine and milk derived from indigenous cow breeds, which have a little hump on their back. The hump, according to Hindu scriptures, has a "surya ketu nadi," a vein that absorbs useful solar radiation, which in turn enriches the cow's products, he says. The process of making cow-based products begins with dairy farmers. Soni buys cow dung and urine from farmers across India at a fixed rate. Dung prices go from a penny to 20 cents a kilo (about 2.2 lbs.) depending on if it is untreated or dried. Cow urine goes for up to 70 cents a liter (about a quart). For use in soap, the wet dung is dried and pulverized. It then undergoes heat treatment to destroy bacteria. What remains is a fine brown-black powder that doesn't smell like cow dung. It is added to the soap mix along with essential oils like citronella, basil and sandalwood. Cow dung content in Cowpathy's soaps range from 10 to 23 percent. Soni promotes the soap as having many benefits. It's an excellent exfoliant, he insists, and adds that "Cow dung is known to cure many skin ailments from eczema to gangrene." He (and others) believe that the medicinal properties of herbs eaten by a cow remain in the dung. In fact, panchgavya, a concoction of cow's milk, clarified butter, yogurt, urine and dung, is believed to cure a slew of diseases including cancer and diabetes. Soni uses this mixture in his products, too. There is no scientific evidence to support any of these claims. Last year, the BJP-led Indian government established a steering committee to start a national program called Scientific Validation and Research on Panchgavya (SVAROP). It will promote research on the medicinal benefits of panchgavya. "We are looking backward rather than looking forward," says Dr. Vineeta Bal, a Pune-based immunologist. "If the government is going to direct a significant amount of money to [the] panchgavya mission and this is getting done at the cost of doing modern science, I think there is a problem," she says. Traditional medicine shouldn't be immediately dismissed as pseudoscience, says Dr. Mahendra Singh, a cancer researcher at the University of Miami's Miller School of Medicine. But every claim needs to be proved using modern scientific tools, he says. The jury may be out on whether cow-based products have any real health benefits but that doesn't seem to affect their popularity. "Demand is increasing day by day," says Soni. Cowpathy Care has an annual turnover of $275,000 and Soni plans to double it in the next couple of years. Soni says all his products are made as per the Indian Food and Drug Administration's guidelines. He has never had trouble with any foreign government agency while selling his products abroad, he says. 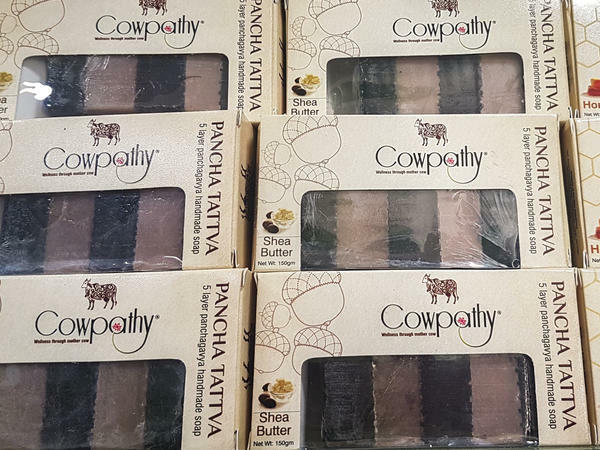 The retail giant Costco recently showed interest in selling Cowpathy products in their stores in United Kingdom. They are already available on e-commerce websites like Amazon and the India-based Flipkart. In the coming years, Soni says he plans to launch 150 new items. There will be flavored beverages, makeup made from cow-based products and ... coffee beans roasted over dried cow dung.